The deadline for entering the 2019 ILDA Awards has passed. Thanks to everyone who entered. If you entered on or before Monday, April 1 but you are NOT on the list below, contact ILDA as soon as possible. Each entrant should have received an email confirmation after ILDA has reviewed the entry. Often this email will ask for other information. If you entered and are on the list below but did not receive any email confirmation or questions, contact ILDA as soon as possible. A few entrants have not yet renewed their 2019 ILDA dues. If you are not sure of renewing, log into ildamember.com and check that you are a 2019 Member. Non-member entries will not be judged. The remainder of this page is left for reference, even though the Awards Entry deadline has already passed. This page is for persons entering the 2019 ILDA Awards. You may enter laser shows produced or performed between January 1, 2018 and March 31, 2019. Winners of these Awards will be publicly presented at the ILDA Awards Banquet and Presentation during the 2019 ILDA Conference (date and location not yet set). For the Artistic Awards, only ILDA Members may enter. For the Technical Awards, anyone may enter the ILDA Digital Network Standards category; only ILDA Members may enter the General category. For Career Achievement, only ILDA Members may make a CAA nomination; however, any person may be nominated (they do not have to be an ILDA Member). The deadline for entering all three Awards is Monday April 1, 2019, by 11:59 pm your local time. Details are below. If you have any questions or comments, please contact ILDA. Any ILDA Member in good standing (dues have been paid, no Ethics or other issues) may enter the ILDA Artistic Awards. Because the spreadsheet relies on some Excel-specific features, use only Microsoft Excel to fill out the form. If you do not have Excel, please check with an associate, friend, etc. to use theirs. If you have any problems, contact ILDA. Make a single compressed “zip” file that contains the filled-in Entry Form, the filled-in Entry Spreadsheet, and your video and photo files. Upload your Award entry zipped file to your own filesharing service such as Dropbox, Google Drive or OneDrive. Then email to ILDA with the link where we can download your file. •	Category 8, Multi-Effect Laser Show: Clarify that this must include LASER images on a projection screen. •	Categories 11-13, Beams/Atmospherics: Must be only beams/atmospherics. No graphics or abstracts, no matter how brief, are permitted. •	Category 15, Permanent Installation: The video must actually SHOW the permanent installation. 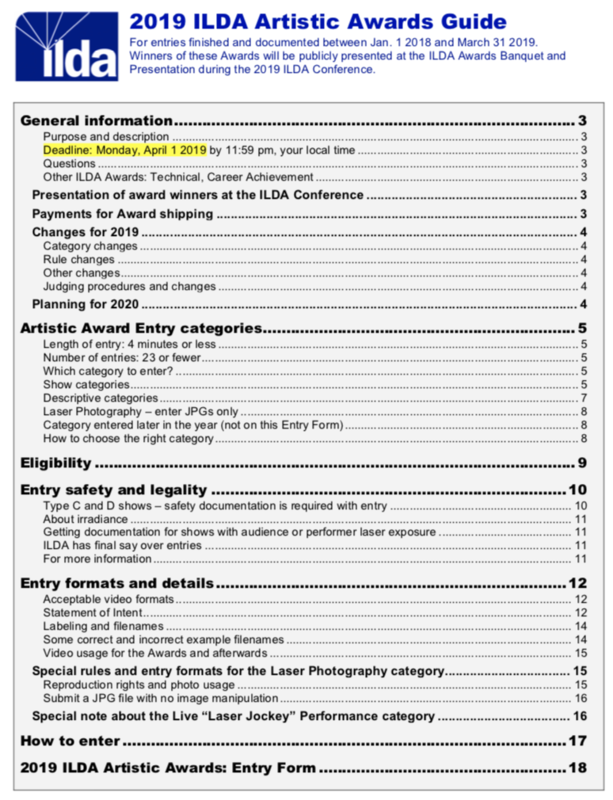 •	Clarified that for Laser Photography entries, you must have permission from the photographer to enter the photograph in the ILDA Awards, and the photographer must agree to ILDA’s usage terms. Do not simply copy a photo from a website. •	Removed a rule prohibiting lasers close to heads without sufficient safety documentation. Note that safety documentation may be called for by ILDA (at its discretion) as per the Entry Safety and Legality section of the Awards entry rules. •	Gave ILDA the right to move entries if a particular category does not have enough entries. •	Deadline to enter had been March 31 2019 until vote of the ILDA Board on March 26 to extend by one day. Deadline now is Monday April 1 2019. •	Judging will be done with judges viewing videos separately (up through 2017 judges were in the same room). •	Judges may differ for various categories (up through 2017 the same three judges looked at all non-photo Artistic categories; now each category may have a different group of three judges). The Fenning Award for Technical Achievement is given for outstanding technical achievement in the field of laser shows and displays. Entries may be a product, or a working technical demonstration. Examples include, but are not limited to: lasers, scanners, projectors, effects, hardware and software. There are two categories; general technical achievement and “IDN Standards.” The latter is for entries which implement, use, extend or otherwise help to advance the use and/or capabilities of the ILDA Digital Network standards. For the general technical achievement category, any ILDA Member in good standing (dues have been paid, no Ethics or other issues) may enter. For the IDN Standards category, anyone may enter — ILDA Member or non-member. Note that the Fenning Technical Award does NOT use an Entry Spreadsheet. For each Technical Award entry, make a single compressed “zip” file that contains the filled-in Entry Form, and any supporting documentation such as videos, JPGs and/or PDFs of user manuals, product sheets, etc. Upload your Technical Award entry zipped file to your own filesharing service such as Dropbox, Google Drive or OneDrive. Then email to ILDA with the link where we can download your file. ILDA Members: Since you are limited to a maximum of six Technical Award entries (three entries per category, and two categories), this means you will have at most, six zip files to upload. Non-members: Since you are limited to a maximum of three IDN Standards category entries, this means you will have at most, three zip files to upload. Deadline to enter had been March 31 2019 until vote of the ILDA Board on March 26 to extend by one day. Deadline now is Monday April 1 2019. You do not need a special entry form to nominate someone for ILDA’s highest honor, the Career Achievement Award. You can simply enter by sending one or more nominations by email to ILDA by the deadline, Monday April 1, 2019 (at 11:59 pm your local time). 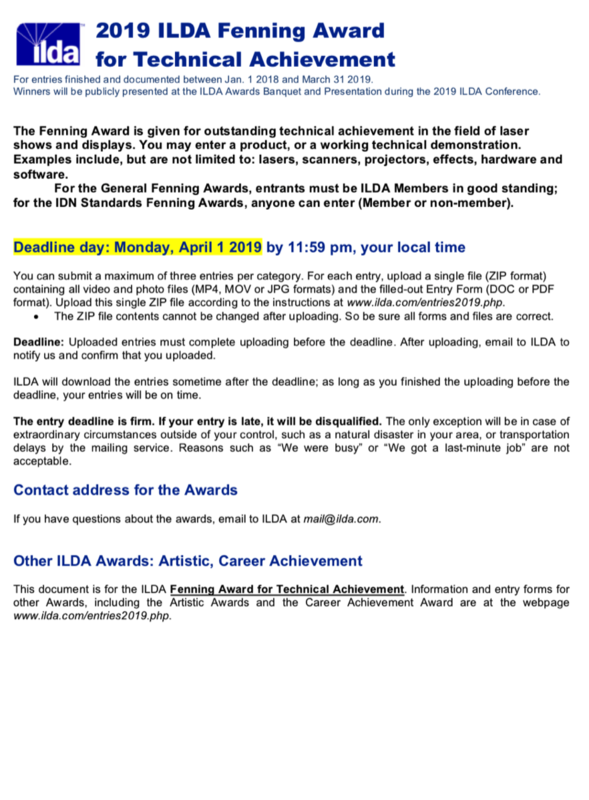 An ILDA Member can nominate any person who is an "exceptional individual with a distinguished history of achievement in the laser display industry." The nominee can be anyone -- they do not have to be an ILDA Member. The nominee can have achieved in one, two or all three of these areas. In whatever area(s) they worked, the person should have made significant and lasting achievements in the field of laser display. Here is a list of past CAA winners. To enter, submit the nominee's name, plus a biography/description of the person. This can be a basic bio/description. Later, after the deadline, we will ask for a more detailed biography/description. This should go beyond just a "resume listing" of places they have worked. It should include information about the career of the nominee and why his or her achievements are significant. If you are nominating another person, feel free to work with them, so they can help put together this document. As a guide, past CAA nomination biography/descriptions have been from 1 to 10 pages, with the average about 2-3 pages. Send your CAA nomination via e-mail to ILDA. Your nomination submission is confidential; no one will be told who made the nomination. We will use the most recent biography/description in our files. If you want to submit a new or revised biography/description, send this via e-mail to ILDA by the deadline. To re-nominate someone, email to ILDA by midnight, your local time, Sunday, March 31, 2019. All nominations received by the deadline, plus the "automatic" nominees, will be listed on the ILDA website later in the year. ILDA Members will be able to vote via email for the CAA nominees. And, at the 2019 ILDA Conference, the winner of the 2019 Career Achievement Award will be publicly announced. When you are completely finished and ready with your forms and videos, submit your ILDA Artistic and Technical entries by uploading them to your own filesharing service such as Dropbox, Google Drive or OneDrive. Then email to ILDA with the link where we can download your file. • For Artistic Award entries, create a single compressed “zip” file containing your filled-in Entry Form, filled-in Entry Spreadsheet, video files, and (if entering Laser Photography) JPG files. If you have multiple entries, all of them should go in the single zipped file. • For each Technical Award entry, create a single compressed “zip” file containing your filled-in Entry Form, and any supporting documentation such as videos, JPGs and/or PDFs of user manuals, product sheets, etc. If you have multiple entries, each one should be in its own zipped file. Include your name (company or individual) in the zipped file’s name, so we know who it is from. Next, upload to your own filesharing service such as Dropbox, Google Drive or OneDrive. Then email to ILDA with the link where we can download your file. Important: You can only upload one zipped file for Artistic Awards, and up to three zipped files for Technical Awards (one per Tech Award entry). Once you have uploaded a file, do not upload new versions — ILDA will use the first (and hopefully only!) version. If there are any technical problems with the files, we will notify you.